You will board your motor coach for the 40-minute drive along a picturesque and twisting road, towards the site of Epidaurus. The famous Theater of Epidaurus is the best-preserved ancient Greek Theater. Located next to the sanctuary-hospital of Asclepius, the ancient Greek God of Healing, the theater’s function was directly connected with this sanctuary. Famous for its superb acoustics, the theater was built in the 4th century B.C. and had a capacity of about 12,000 spectators. People arrived from all over the Greek world in order to attend the religious events there. Due to the architect’s excellent design, the acoustics are so good, you can be sitting right at the top in the last row and still hear even a coin dropping in the middle of the stage. Your tour will then proceed to Palamidi, an impressive Venetian Fortress, which dominates the city of Nafplio. A part of the Palamidi Fortress was used as a prison after the liberation of Greece from the Turks. Its location offers a wonderful photo opportunity as it overlooks the entire Argolic Valley. Explore at your leisure with a private vehicle, driver, and English-speaking guide. This exclusive tour will allow you to customize your time ashore and explore the most interesting sites in the comfort and privacy of your own car. With your private vehicle, and the personalized attention of your driver and English-speaking guide, you will have the flexibility and independence to design your itinerary ashore. See the iconic sites of Nafplio, or create your own personal stops to make the experience your own. Please note: Capacity: 1-2 guests. Private cars are ordered per vehicle (not per person). This tour includes transport in a private car, driver and English Speaking Guide. Itinerary can be adjusted with tour guide as long as it’s in the Nafplioarea and does not exceed the duration of 8 hours. Recommended for physically challenged guests. Explore at your leisure with a private vehicle, driver and English-speaking guide. This exclusive tour will allow you to customize your time ashore and explore the most interesting sites in the comfort and privacy of your own van. With your private vehicle, and the personalized attention of your driver and English-speaking guide, you will have the flexibility and independence to design your itinerary ashore. See the iconic sites of Nafplio, or create your own personal stops to make the experience your own. Please note: Capacity: 3 - 6 guests. Private vans are ordered per vehicle (not per person). This tour includes transport in a private van, driver and English Speaking Guide. Itinerary can be adjusted with tour guide as long as it’s in the Nafplio area and does not exceed the duration of 84 hours. Recommended for physically challenged guests. Please note: Capacity: 1-2 guests. Private cars are ordered per vehicle (not per person). This tour includes transport in a private car, driver and English Speaking Guide. Itinerary can be adjusted with tour guide as long as it’s in the Nafplio area and does not exceed the duration of 4 hours. Recommended for physically challenged guests. Mileage limit is 50 km (31 miles). Explore at your leisure with a private vehicle, driver, and English-speaking guide. This exclusive tour will allow you to customize your time ashore and explore the most interesting sites in the comfort and privacy of your own van. With your private vehicle, and the personalized attention of your driver and English-speaking guide, you will have the flexibility and independence to design your itinerary ashore. See the iconic sites of Nafplior, or create your own personal stops to make the experience your own. Please note: Capacity: 3 - 6 guests. Private vans are ordered per vehicle (not per person). This tour includes transport in a private van, driver and English Speaking Guide. Itinerary can be adjusted with tour guide as long as it’s in the Nafplio area and does not exceed the duration of 4 hours. Recommended for physically challenged guests. Mileage limit is 50 km (31 miles). You will board your motor coach for the 30-minute scenic drive through Nafplio and past the ancient sites of Tiryns to the ruins of Mycenae. The first in-depth excavations were carried out by the German archaeologist Schliemann in 1876, who was obsessed with finding the grave of Agamemnon. His diligent work exposed the famous Lions Gate, the entrance to the city, which contains the shaft burial graves of some ancient nobles. A short distance away is the Beehive Tomb, so called due to its unusual shape. Then a short drive will bring you to Fithia Village where a brief shopping opportunity will take place. On the second part of your journey you will return to Nafplio where the Castle of Palamidi stands. From this vantage point there is a lovely panoramic view. The castle was built by the Turks and the Venetians as a fortress and until recently, was used as a prison. The castle is still in a good state of preservation and offers great views and photo opportunities over the entire Argolis bay. Explore the tiny uninhabited island of Delos, one of the most important archaeological sites in all Greece. Start your journey with a 45-minute ferry ride to this richly historic site. Delos was the major center of the ancient Greek world and the mythical birthplace of the god Apollo and his twin sister Artemis. Your 2½-hour guided stroll includes such attractions as the Sanctuary of Apollo with its three temples dating from the 6th and 5th centuries B.C. To the west of this sanctuary lies the Sacred Lake, where Apollo was reputedly born. Standing guard over the Sacred Lake are nine replicas of the famous marble lions, which were a gift from the people of Naxos in the 7th century B.C. Other attractions include the amphitheater and the nearby theater quarter where wealthy owners built opulent houses with grand colonnaded courtyards. The island’s checkered history finally led to its destruction in 88 B.C. by Mithridates, the King of Pontus. Large-scale restoration work has continued for many years and in 1990 the island was declared a World’s Cultural Heritage Site, protected by UNESCO. Your guided walk concludes back at the ferry, for direct return to Mykonos. On arrival there, you are free to return to the yacht at your leisure. Please note: As there is extensive walking on this tour, comfortable shoes are recommended. Join in an adventure to discover a different face of Mykonos. You will visit Little Venice on a walking tour and see Mykonos Castle, where you can take pictures of the famous windmills of Mykonos. You will pass by the most photographed church of Paraportiani and then visit a traditional pastry shop where you can taste amigdalota, a local sweet delicacy made of almonds. Then you will board your bus for a short drive to Agios Giannis Beach, a traditional small port. Wander around this beautiful bay and take pictures of Delos island, lying just opposite. Re-board the bus for a drive to the center of the island, and a traditional Mykonian farm. Here you will do some wine tasting. Visit the traditional village of Ano Mera. Continue with a walk to the main square with its marble patio and mingle with the locals to get acquainted with the history of the village. You will then continue to the local traditional Taverna of Apostolis, to enjoy a glass of ouzo and homemade meze, prepared especially for you by the owner’s wife, accompanied by a live Greek music show. On the way back to Mykonos you will receive a small gift, to take with you - the unique fragrance of Mykonos. Upon arrival you have some free time to walk around the narrow streets of Mykonos with its charming whitewashed houses. Please note: There is no wheelchair access to Agios Giannis Beach or the monastery. During the summer there is not much shade so it is advisable to wear a hat or visor, sunglasses, and bring sunscreen. Wear comfortable walking shoes. Try to imagine a perfect Cycladic village - it would probably look exactly like Agios Ioannis. Then step into a 5-star luxury resort in Mykonos and you’ll immediately sense: this isn’t Mykonos as you know it. Immerse yourself in the pristine beauty of a private oasis within a cosmopolitan destination. Embracing the best that Mykonos has to offer the resort will showcase an unconventional “made in Greece “ concept of luxury. You will spend relaxing time at a luxurious resort which includes:pick up from and drop off back to your cruise ship, use of the resort’s facilities like sunbeds, umbrellas, the gym, sauna, Turkish bath, swimming pool and private beach. Please note: Bring your swimsuit, towel, exercise wear, sunscreen, and sunglasses. During the 19th century Ermoupoli was Greece’s principal port and stands on a natural amphitheater site. You will board your motor coach that will take you from the port up the long, steep hill to the top where you will see the Cathedral of St. George. You will visit this 14th century building before descending on foot to visit the Cappuchin Monastery of St. John. You will walk to the bottom of the hill and re-board your coach for the drive across the island. You will pass the villages of Vari and Chroussa and reach the village of Posidonia. You will see the outside of the Benaki Mansion, a building that used to belong to one of the most renowned families in Greece and is now the Town Hall. Next you will travel to the seaside village of Finikas where you will stop for refreshments. Continue on your scenic drive through the villages of Giallissas and Talanta on your way back to Ermoupoli. Here your guide will take you on a walking tour visiting the main sites of this beautiful town. Board your waiting motor coach for the 30-minute drive ti Kini Beach. Wear your swimsuit under your clothing; bring a towel, sunscreen and a hat. You will spend approximately 3 hours enjoying this lovely beach exactly as you please. The beach is wide and sandy with shallow water. Taverns and cafes are also available. Meet your professional guide and set off to visit the ruined city of ancient Ephesus, a UNESCO World Heritage Site founded by the Carians and Lelegs. Today, this is one of the most magnificent and best-preserved archaeological sites in the world. You will see the glorious Celsus Library façade, restored and reconstructed in the 1970s, the Temple of Hadrian, and the Great Theatre with a seating capacity of 25,000 people. Then, you will visit a new ongoing excavation site of the Church of Mary inside Ephesus. The church is located in the south stoa of the Olympian next to the harbor of Ephesus. This is a very important church for Christianity because it was the first one devoted to the Virgin Mary. The Council of Ephesus and the Synod declared that church as the center of Christianity in 449 A.D. Your guide will share some little-known details about the life and times of the ancient city. You will also visit the Ephesus Archaeological Museum. This small museum in Selcuk boasts an incredible collection of Hellenistic and Roman statues, carved reliefs and artifacts unearthed from the ruins of Ephesus. The famous statue of Artemis (goddess of fertility) is housed here. At the end of your tour, you will stop for refreshments and a carpet demonstration at a local weaving village. Enjoy watching the skilled artisans spinning and dyeing yarn and weaving carpets. From here you can either return directly to the ship or stay in Kusadasi. Guests who wish to stay in town to shop or explore on their own are welcome to do so, but must return to the ship on their own. Please note: This tour involves a great deal of walking over uneven terrain. Comfortable walking shoes with non-skid soles are highly recommended. The first place you will visit on this exciting tour will be the Virgin Mary’s House. Archaeological evidence shows that the little house dates from the 6th century but that the foundations were from the first century. Next you will visit the Ephesus ruins, a UNESCO World Heritage Site predominantly from the later Roman period. Next, you will visit the Ephesus Archaeological Museum. This small museum in Selcuk boasts an incredible collection of Hellenistic and Roman statues, carved reliefs and artifacts unearthed from the ruins of Ephesus. The famous statue of Artemis (goddess of fertility) is housed here. Then, your tour will continue to the ruins of the Basilica of St John. The Basilica had a cruciform plan with four domes along its longitudinal axis and a pair flanking the central dome to form the arm of the cross. Under the central dome was the grave of St John. Lunch will be served at a lovely local restaurant on the way back to Kusadasi. You will have a fabulous view of the harbor and the ship.Upon your return to Kusadasi, you may enjoy a carpet weaving demonstration and some time for shopping. Explore the town and return to the ship. Please note: There is a lot of walking on this tour with many steps and rough and uneven terrain. Flat, comfortable shoes are highly recommended. The last 3 miles to the Virgin Mary’s House is a winding road up to an altitude of 1,250 feet. Visit the ruined city of ancient Ephesus, a UNESCO World Heritage Site, founded by the Carians and Lelegs. You will see the glorious Celsus Library façade, restored and reconstructed in the 1970s, the Grand Amphitheater and the Temple of Hadrian. Visit the “Terrace Houses” located opposite Hadrian’s Temple, a newly excavated area. Next you will discover the beauty of Sirince Village, the perfect synthesis of Turkish-Greek culture where you will stroll through the streets and see the typical Greek houses. You will have time to purchase some local handicrafts that the village ladies sell on the streets. The tour features a charming church dedicated to St John that you can view high above the village. A private lunch has been arranged for you in a beautifully restored local building, with spectacular views overlooking an amazing valley of fruit and olive trees and lots of grapevines. Here you will experience the local cuisine with the best of Turkish hospitality. Taste a few of the local wines throughout your private lunch. Upon your return to Kusadasi, you may enjoy a carpet-making demonstration and have some time for shopping. Explore the town and return to the yacht on your own. Please note: This tour involves a great deal of walking over uneven terrain. Comfortable walking shoes are highly recommended. Ancient Ephesus, a UNESCO World Heritage Site, is one of the greatest outdoor museums in Turkey and perhaps in the world. Although now in ruins, it was originally founded by the Carian and Leleg native peoples. Your two-hour walking tour begins after a 30-minute drive from the pier. Magnificent vistas await – including the glorious Celsus Library façade, the Grand Amphitheater and the Temple of Hadrian. The Terrace Houses owned by the wealthy and influential lie opposite Hadrian’s Temple, in a newly excavated section. Their fine decorative mosaics and frescoes give a fascinating insight into ancient lifestyles. Terrace Houses on the slopes of Bulbul Mountain are accessed by steps, with their roofs forming terraces for those houses above them. Back in Kusadasi, there’s an opportunity to see a carpet-making demonstration, to independently explore the town or perhaps browse among the shops before taking an easy stroll back to the ship. Please note: As this excursion involves extensive walking, comfortable shoes with non-slip soles are recommended. At Terrace Houses, guests will walk on glass-covered platforms. Take a step back in time on this excursion to the Virgin Mary’s House and ancient Ephesus, a UNESCO World Heritage Site. A 30-minute drive will bring you to the House of the Virgin Mary, where she is said to have lived the last years of her life. This hallowed site, which has been officially declared a Roman Catholic shrine, has hosted three Papal visits since 1967. Then you will take a 10-minute drive to Ephesus, where you will see with the Odeon Theatre, the Celsus Library and Hadrian Temple. This impressive Corinthian-style temple was dedicated in A.D. 118 and reconstructed in the 4th century. You will see the Great Theatre, dating back to the Hellenistic period. It was at this monumental site that St. Paul preached. As its acoustics remain excellent, this theatre is still in use today. The Marble Road which runs between the Theater and the Celsus Library is part of a sacred walkway. On your return, you will sip apple tea as a myriad of colors unfold before your eyes during a carpet-making demonstration. Or, you may return directly to the yacht, or remain in Kusadasi to shop or explore the town independently. Please note: Although there are no uphill surfaces, this excursion does involve extensive walking. Comfortable walking shoes with non-slip soles are therefore recommended. Please note: Capacity: 1 - 10 guests. Private vans are ordered per vehicle (not per person). This tour includes transport in a private van, driver and English Speaking Guide. Itinerary can be adjusted with tour guide as long as it’s in the area and does not exceed the duration of 8 hours. Recommended for physically challenged guests. Please note: Capacity: 1 - 10 guests. Private vans are ordered per vehicle (not per person). This tour includes transport in a private van, driver and English Speaking Guide. Itinerary can be adjusted with tour guide as long as it’s in the area and does not exceed the duration of 4 hours. Recommended for physically challenged guests. Explore at your leisure with a private vehicle, driver, and English-speaking guide. This exclusive tour will allow you to customize your time ashore and explore the sites most interesting to you in the comfort and privacy of your own car. With your private vehicle, and the personalized attention of your driver and guide, you will have the flexibility and independence to design your own unique tour. Please note: Capacity: 1-2 guests. Private cars are ordered per vehicle (not per person). The number of vehicles is limited, so reserve as early as possible. The price shown is the total for the vehicle so only one person will need to reserve it. The price includes vehicle, driver, and personal guide to take you to the sites of your choice. It does not include entrance fees to any particular sites. Please note: Capacity: 2 - 6 guests. Private vans are ordered per vehicle (not per person). The number of vehicles is limited, so reserve as early as possible. The price shown is the total for the vehicle so only one person will need to reserve it. The price includes vehicle, driver, and personal guide to take you to the sites of your choice. It does not include entrance fees to any particular sites. Explore at your leisure with a private vehicle, driver, and English-speaking guide. This exclusive tour will allow you to customize your time ashore and explore the sites most interesting to you in the comfort and privacy of your own van. With your private vehicle, and the personalized attention of your driver and guide, you will have the flexibility and independence to design your own unique tour. An island of rare beauty captivating the visitor at first glance, Patmos has a picturesque harbor dominated by the imposing Monastery of St. John standing on the hill above. Leaving Skala harbor, you will take a 10-minute drive to the impressive village of Chora. The Monastery of St. John is situated among gleaming white houses forming a startling contrast to its dark mass. Built in 1088, it has thick, high walls crowned all around with battlements and a total of eight chapels. The courtyard is laid with pebbles and decorated with arches through which one can see the intricately designed frescoes adorning the chapel entrance. The museum houses a magnificent collection of jeweled chalices, crowns and crosses, icons and religious paintings, including an original El Greco. Your tour will continue with a visit to the Grotto of St. John, a 17th century monastery built around the cave where St. John lived for two years while he wrote of the Apocalypse. Inside you can see the stone which he is said to have used as a pillow. After this memorable tour, you will embark the coach for the short ride back to the port. Please note: Wear comfortable walking shoes and sun protection. Depart from the pier for a short scenic ride first to the Grotto of St. John where he heard the voice of God, wrote his revelations, and spent 16 months in exile. This simple cave is now a chapel and place of pilgrimage. Continue on to the Monastery of St. John the Theologian, built on an ancient acropolis. The monastery’s massive 15th century walls and 17th century battlements looming over the town, belie an intimate and peaceful interior of arches, inlaid pebble stone floors and whitewashed buildings. The charming chapel of Christodoulos is profusely decorated with frescoes and the old treasury, and displays a breathtaking collection of jeweled chalices, crowns, crucifixes, vestments and old manuscripts. Departing the monastery, you will walk the nearby winding streets where houses dating back to the 16th century are linked by a maze of steps and lanes interspersed with small squares. Visit the 300-year-old Simandris House with its rich collection of antiques and architecture. Wind down your excursion at a local taverna, where you will have the opportunity to discover the “Zorba” in you as you sample tasty mezes with Greek wine or ouzo and enjoy traditional Greek dances. Indulge your senses with the history, beauty and flavors of Rhodes during this orientation drive and cooking demonstration. From the pier, you will follow the Mandraki Esplanade, passing the Church of Annunciation and a replica of the Old Church of the Knights of St. John. At the entrance to Mandraki Port you see the deer statues, where it is believed the Colossus of Rhodes, one of the Seven Wonders of the Ancient World, once stood. Your drive then ascends Mount Smith for panoramic views of Rhodes and the Aegean Sea. The Acropolis of Rhodes and the ancient 2nd century B.C. stadium both lie atop this vantage point. Proceed to the Old City of Rhodes, a UNESCO World Heritage Site where you leave the coach at the Gate d'Amboise for a 1¼-hour guided walking tour. After passing the Grand Master’s Palace you will stroll down the Street of the Knights, and pass the 15th century Archaeological Museum, and the former Knights’ Hospital, which is regarded as the Old City’s most well preserved building. Your walk will conclude at a Greek taverna, where a chef demonstrates cooking several classic Greek dishes, including tzatziki and fried meatballs and you will learn cooking tips from the expert. At the conclusion of the demonstration, you will be invited to sample the foods you have helped prepare before reboarding your coach for the return drive to the pier. Please note: Comfortable walking shoes are recommended. Departing from the quayside in Rhodes, you will proceed to Mount Smith, the Acropolis of ancient Rhodes. From the tumbled massive pillars of the Temple of Athena, the view encompasses the Temple of Apollo, the stadium of Diagoras, and the port. Then you will proceed to Bonis Ceramic Workshop where you will be given a special apron and an overview on the art of ceramics. You will see the instructor demonstrate how to use of the pottery wheel. Working in groups of 3, you will then have the opportunity to make your own pottery vase under the guidance of the instructor, using the pottery wheel. You will then be able to carve a design of your choice on a raw plate provided by the workshop. The vase and the plate will then be baked and colored by the ceramic technicians, and when finished will be sent to your home. There will be ample time, after the pottery lesson, for you to browse through the Ceramic Workshop’s exhibition to admire the beautiful Rhodian Ceramics on display. Then, you will head to Limanaki to a beautiful Greek taverna on the beach where you will be served traditional ouzo and local appetizers. Please note: The maximum number of participants for this tour is 16. Take a leisurely stroll through the medieval city of Rhodes, a historically acclaimed UNESCO World Heritage Site. Your approximately 3-hour guided walk will begin at the Gate of Panagia Bourgou and proceed directly to the Jewish Quarter. After passing the Synagogue, you progress further into the city center before continuing along the picturesque cobbled streets of the busy Turkish District. Your attention is drawn to the Mosque of Suleiman, with its elegant Italian Renaissance doorway. You then head toward the 14th century Palace of the Grand Masters and continue down the Street of the Knights, past medieval buildings, towers and emblazoned façades. Your walk will conclude in Hospital Square, from where it is only a short stroll back to the port. Alternatively, you may wish to spend additional independent time among the numerous cafés, restaurants and shops of the medieval town before returning at your leisure. Please note: The order of sites visited may vary. This program is entirely on foot and there is no sightseeing by coach. Comfortable walking shoes are recommended. Picturesque Lindos, lying on the east coast of Rhodes, is renowned as an important archaeological site and popular visitor resort. Your one-hour journey follows the east coast past quaint villages, orange and lemon groves, vineyards and gnarled old olive trees. During your two-hour stay in Lindos you may either walk up to the summit of the Acropolis or, alternatively, take a donkey ride for most of the distance. At the top of your ascent, numerous archaeological sites await, including the 4th century B.C. Doric Temple of Athena Lindia and a double-winged portico. Other attractions include a Byzantine church, and the remains of the Governor’s quarters. There are breathtaking panoramas from atop the Acropolis, including St. Paul’s Bay, where the Apostle is said to have landed in the year A.D. 51 to preach Christianity to the Rhodians. Gathered below the Acropolis, are the old, whitewashed houses and narrow streets of this picture-perfect town, whose beauty has inspired artists and writers for generations. Before leaving Lindos, you may wish to browse among the many tempting shops offering such items as ceramics and crocheted linen. Your return is along the same picturesque route as your outward journey. Departing in your air-conditioned motorcoach, after a short drive you will arrive at the beautiful Plaka village, where you will board your private boat to Kalidon, or the Island of Spinalonga, at the entrance of the Bay of Elounda. The island of Spinalonga has a rich history dating back over 8 centuries. From the start of the Byzantine Empire in the early 13th century, it became a crucial outpost of the Venetian power base on Crete for the next 400 years, resulting in the huge fortifications that still dominate the landscape. The island fell to the Ottoman Empire in 1715, and from then until the turn of the 20th century, it was used as a leper colony, finally closing its doors when the last sufferer departed in the 1950s. Today, the unoccupied island with its fortifications is one of the main tourist attractions in Crete. Return to the Cretan shore and Plaka, where you will arrive at a seaside taverna well known by locals for its fresh fish and Greek cuisine. Relax in its lovely view overlooking the sea, and enjoy a glass of Raki and Greek snacks called mezzes. Following this refreshing interlude, you will be driven back to the Agios Nikolaos village where you will have free time for strolling around the picturesque village or you can return to the pier. Your first destination today will be the renowned archaeological site of the Palace of Knossos. This locale was once the religious and administrative center of the Minoan world. You'll explore the labyrinth built to confine the fabled Minotaur. Legend holds that the king fed his enemies to this monster until the secret of the labyrinth finally unraveled. Your guided tour will take you through the ruins of the palace complex, now excavated and partially reconstructed to offer a better understanding of the complex labyrinth. Visit the living quarters of the monarchs, the storerooms, potters' workshops, and the theater. From Knossos, you will continue to the Archaeological Museum of Heraklion - one of the most important museums of Greece with a notable collection of artifacts from the Minoan Civilization of Crete. Within the museum all the main artifacts are on display, including the Phaistos Disk, the Snake Goddess, Bull-Leaping and King of the Lilies frescoes. The exhibit includes approximately 450 items in chronological order. After your visit of the site you will have lunch at a traditional restaurant before heading back to the port of Agios Nikolaos. Join an expedition to the Palace of King Knossos, once the religious and administrative center of the Minoan world. Explore the labyrinth built to confine the fabled Minotaur, born out of the unnatural union between King Minos' queen and a bull. Legend holds that the king fed his enemies to this mythological monster until the labyrinth's secret was finally unraveled. You will travel from Agios Nikolaos across the island to Heraklion to visit this renowned archaeological site. The guided tour will take you through the ruins of the palace complex, now excavated and partially reconstructed to give a better understanding of the complex labyrinth. You will visit the living quarters of the king and queen, the storerooms, potters' workshops and the theater. After your visit of the site you will head back to the port of Agios Nikolaos. Santorini, in the Cyclades Islands, has one of the most spectacular landscapes in all Greece. Traditional villages built on tall cliffs offer breathtaking views over a former volcanic crater, now submerged by the sea. Your island orientation begins with an ascent of Profitis Ilias (Prophet Elias) Mountain, for unparalleled panoramic views encompassing the whole island. Back aboard the coach, you will admire a range of inspirational views en route to the village of Oia. With its picturesque blue-domed churches, old 2-story mansions, and narrow cobblestone streets, Oia is the perfect place to fully appreciate the beauty of this remarkable island. There is no guided sightseeing during your 1¾-hour stay at Oia, so you are free to admire the picture-perfect views or perhaps browse among the tiny shops selling handmade ceramics, paintings and semi-precious jewelry. Finally, there’s a 30-minute drive to the village of Fira where the tour concludes. Once there, your guide directs you to the cliff road from where you may proceed to the cable car at your leisure to return to the ship. Please note: This tour involves winding roads and high altitude. Get ready to set sail on the exquisite Santorini during this scenic, relaxing ride around the volcanic islands of Nea Kameni, Palea Kameni and Thirassia. You will board a Catamaran sailing vessel for a 3.5-hour tour . Palea Kameni and Nea Kameni represent the volcano’s most recent activity. Palea Kameni, or Old Burnt Island, is less than 2,000 years old, while Nea Kameni, or Young Burnt Island, began forming just 425 years ago. Your boat will drop anchor into the green sulfur waters where you will enjoy an opportunity to swim in the warm waters of the thermal spring. 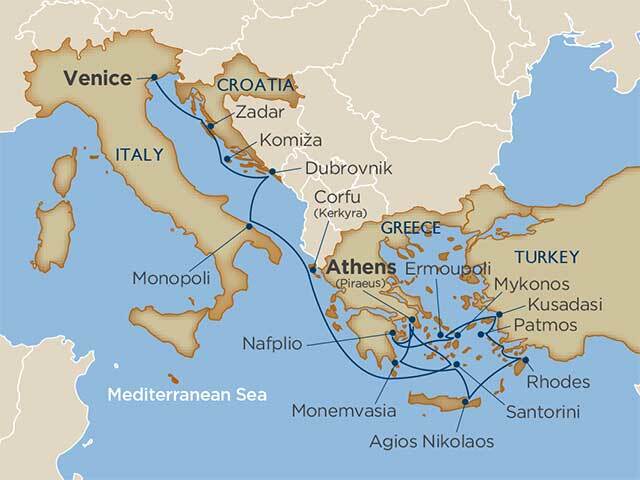 A delicious Greek lunch of chicken, pasta, Greek salad, fruit and beverages will be served on board while sailing. Please note: Bring your swimsuit, a towel, sunscreen, sunglasses and your camera. You will be transferred from the ship by a local tender to Athinios where you will join the waiting motor coach. A short journey brings you to one of Santorini’s foremost wineries where you will be able to sample some of the most famous wines of Santorini. Leaving Santo Winery you will travel to Venetsanos Winery, located in a breathtaking location offering incredible vistas over the caldera and volcanic islands. The winery offers you a chance to walk through and discover the history and tradition of this important wine producer and learn new wine making techniques. Your detailed tour of the winery will include tasting their exceptional wines. Next you will visit the unique, underground labyrinth Wine Museum of Santorini where you will navigate the history of wine and have the opportunity to try four of the best wines. Board your coach and travel to the most northern point of the island, Oia Village. This dramatic little village, has many of its dwellings nestled in niches hewn into the volcanic rock. As you traverse its narrow cobbled streets you will come across many tiny shops which offer an unusual collection of handmade works of ceramic art, paintings and semi-precious jewelry. Coffee shops perched on the edge of the cliffs offer spectacular views of Fira and the volcano. Finally, you will board your coach and go to Fira town where your tour will end after a short walk to the Metropolis Church. From there you may decide whether to stay in the town and do a bit of shopping or to make your way back to the ship directly by taking the cable car to the pier below. Please note: None of these destinations are wheelchair accessible. Monemvasia is unique among ruined medieval cities in that it is entirely built on a rock that appears to be barren when seen from the mainland. Your tour will commence with a walk through the narrow streets within the castle walls, so tiny that in many places only two people can walk side by side. You will see the ruins of houses and Byzantine churches — most in ruins with the fortunate exception of the Church of Christ Elkomenos. This cathedral dates back to the 13th century, but features alterations made during the Venetian occupation of Monemvasia. Four surviving ancient Byzantine icons are on display. Please note: Wear comfortable walking shoes, sunglasses, and sunscreen. Bring a hat. Guests must be physically fit. Minivans will operate as shuttles from the tender to the gate of the Old Town as larger coaches are not permitted on the road to the Old Town. Monemvasia is unique among ruined medieval cities in that it is entirely built on a rock that appears to be barren when seen from the mainland. Your tour will commence with a walk through the narrow streets at the castle, where the streets are so tiny that in many places only two people can walk side by side. While strolling along these narrow lanes you will see ruined houses and Byzantine churches and Church of Christ Elkomenos. This cathedral dates back to the 13th century, but features alterations made during the Venetian occupation of Monemvasia. Then you will visit “Liotrivi”(Olive Oil Factory), a fully restored historic mansion that previously was the home of the family Ritsos, where the world-renowned poet lived during his childhood. You will have a guided tour in the old olive mill and learn the traditional method of producing extra virgin olive oil. You will walk to the vineyards and the olive groves. In a patio area, an experienced cook will knead and bake traditional bread in a wood-oven. The bread made, along with other local products, will be served to you in an appetizer buffet under the olive trees where you will have the opportunity to also taste the famous wines of Monemvasia. Please note: Wear comfortable walking shoes, sunglasses and sunscreen. Bring a hat. Guests must be physically fit. The ancient remains of Athens constitute one of the brightest jewels of the Mediterranean. The Ancient City and the Acropolis, a UNESCO World Heritage Site, have been kept fairly intact. You will see perhaps the most famous temple of the Ancient City, the Parthenon. Walking up a winding path towards the Acropolis, you will pass through the Propylaea, which is the entrance to the Acropolis and see the Erechtheum Temple, built between 421-405 B.C. and famous for its exquisite attention to detail. You will also see the Porch of the Caryatids, (or Porch of the Maidens), in the distance. Reinforced by man, the natural fortress of the Acropolis stands 230 feet above the city. You cannot help but be impressed by the wide-sweeping view below. The intent of the new Acropolis Museum is to house every artifact found on the archaeological site. You will see the unsurpassed quality of the masterpieces of ancient Athens, including the entire sculpted decoration of the Parthenon as it was on the building. You will see many architectural phases and thousands of finds that provide valuable insight into the everyday activities of ancient Greece. Please note: There is no shopping stop organized but guests can explore the shops at the Acropolis. The path up to the Acropolis is winding and may be challenging for those with mobility issues. The ancient remains of Athens constitute one of the brightest jewels of the Mediterranean. The Ancient City and the Acropolis have been kept fairly intact. You will see perhaps the most famous temple of the Ancient City, the Parthenon. Walking up a winding path towards the Acropolis, you will pass through the Propylaea, which is the entrance to the Acropolis and see the Erechtheum Temple, built between 421-405 B.C. and famous for its exquisite attention to detail. You will also see the Porch of the Caryatids, (or Porch of the Maidens), in the distance. Reinforced by man, the natural fortress of the Acropolis stands 230 feet above the city. You cannot help but be impressed by the wide-sweeping view below. The intent of the new Acropolis Museum is to house every artifact found on the archaeological site. You will see the unsurpassed quality of the masterpieces of ancient Athens, including the entire sculpted decoration of the Parthenon as it was on the building. You will see many architectural phases and thousands of finds that provide valuable insight into the everyday activities of ancient Greece. To begin the tour you will pass through the main part of town before entering the delightful countryside. You will notice that Corfu is more lush and verdant than most Greek islands. This becomes apparent as you pass groves of olive, orange and lemon trees, interfused with tall, graceful cypresses on your way to the village of Gastouri. Here you will visit the Achillion, the mansion built by the Empress Elisabeth of Austria and later owned by Kaiser Wilhelm II. The mansion has been restored by the state and the gardens with their statues have been left intact for visitors to admire. The tour will continue to Kanoni. At this site you will see the old cannon from which the name Kanoni came from. From above you will see the nunnery of Vlacherna and Mouse Island in the far distance. You will return to the town by a different route. There you can enjoy a lovely walk through the narrow, balconied streets of the old district on the way to visiting the beautiful church of St. Spiridon before returning to the quayside. This tour visits Paleokastritsa, the area of unique natural beauty on the northwestern shores of Corfu. It is known as the “Capri of Greece” for its rocky promontories cloaked in pine and cypress trees extending out into the sea, hiding small sandy bays and coves with crystal clear turquoise waters glimmering under the bright sun. In Paleokastritsa, you will take a 30-minute boat ride to the famous grottos of the area, the sea caves of “Nafsika,” “Saint Nikolas,” and the “Blue Eye.” Here, the natural ground formations combined with the minerals in the ground and the natural sunlight give life to amazing forms, colors and optical illusions. Upon your return to the main beach, you have free time to enjoy a refreshing dive in the turquoise waters, sunbathe on the soft sand or beach walk, before boarding the coach for the drive uphill to the traditional village of Lakones. You will be driving up the very same serpentine-like, narrow road where the famous car chase in the James Bond movie “For your Eyes only” was filmed. In the village of Lakones, you can admire local village architecture more reminiscent of Italy than of typical Greek villages, before enjoying a “meze” (Greek snack) and tasting wines of the island at the local café at the “Bella Vista,” a location known for the spectacular and breathtaking views it commands over Paleokastritsa. Please note: The trip to the caves is subject to sea and weather conditions. Please note: Wear comfortable walking shoes, and bring your sunglasses, sunscreen, and a hat. During this tour you will discover the town of Bari and soak up the typical atmosphere of south Italy. Your walking tour will start near the Swabian Castle, where you will be able to see women while they prepare the typical home-made "orecchiette" (ear-shaped pasta) as they are sitting outside their houses. You will then proceed to the heart of the old town, to visit St. Sabin Cathedral and St. Nicholas' Basilica. Your tour ends near Piazza del Ferrarese where you will enjoy some free time for shopping before returning back to the ship in Monopoli. After a 30-minute transfer from Monopoli to Polignano a Mare you will enjoy a boat tour. During this boat tour around the impressive Polignano a Mare (which is famous for its white cliffs facing the blue Adriatic Sea) you will be able to admire 9 miles (15 km) of the Apulian coastline. You will also see the wonderful marine caves of the area and enjoy a swim in the pristine water of the sea. During the boat tour you will be told some interesting stories about Polignano and then transfer back to Monopoli port. Please note: Wear comfortable walking shoes, and bring your sunglasses, sunscreen, swimsuit, towel, and a hat. Parasols will be provided on the boat. You will visit the caves of Castellana, which represent one of the most impressive cave complexes of Italy, famous for its spectacular natural galleries and crystalline concretions. After being inside such a natural rocky world, you will then head on to Polignano a Mare, one of the most fascinating small towns near Bari which dates back to the 4th century, and is famous for its white cliffs facing the blue-green Adriatic Sea and coastline. During the guided walking tour you can admire some breathtaking views over the marine caves, while discovering picturesque little streets of the old city center, adorned with flowers and lined with whitewashed buildings and beautiful panoramic terraces. You will enjoy some free time in Polignano before returning back to the ship. Please note: Wear comfortable walking shoes, and bring your sunglasses, sunscreen, and a hat. Surface inside the caves might be slippery. This tour is not recommended for guests with walking difficulties. You will be provided with a life jacket, board your waiting speed boat and depart from Komiza to Stiniva Bay, the most beautiful bay of Vis island. Stiniva Bay has been protected as a Croatian natural monument since 1967. You will take a tour of the famous Green cave which is located on the open-sea side of Ravnik, known for the visible green beam of light that penetrates through the opening on its ceiling and refracts on the sea surface. You can swim here and discover the shimmering green underwater world. Continue to the town of Vis for a short visit and light lunch of traditional Vis Island delicacies including "viska pogaca - pastry with salted fish and tomatoes," anchovies in lemon sauce, fish pate and home made bread, accompanied by a glass of wine. You will continue to the Submarine tunnel, built in the early 80's and embedded in a massive rock in the bay called Parja. The tunnel was used as a secondary position for boats and submarines in the defense of Vis. Interesting to see and you will also get a short history lesson! Enjoy travelling around the north part of the island and listen to stories about the famous Battle of Vis (1866) which took place there. Please note: Wear comfortable walking shoes. Bring your swimsuit, towel and sunscreen. Biševo Island leaves everyone breathless. The combination of natural phenomena, sandy bays and friendly islanders will remain in your memory forever. The Island of Biševo is 5 nautical miles from the town of Komiža and it is best known for its rare natural phenomenon, the Blue Cave. The interior of the cave and the sea inside it are illuminated with an indescribable silver-blue light. The rays of sun passing into the cave through a small crack in its ceiling are reflected in the sea, creating incredible light effects. When you arrive on Biševo at Mezoporat Bay, you will get off the boat and the skipper will take you to a small wooden boat ( owned by a concessionaire), which will take you into the cave. The cave entrance is really small, so at a certain point you will need to crouch in the center of the boat while the skipper manages the boat into the cave. Upon visiting Blue Cave, rejoin your speed boat for the scenic ride back to Komiza. Please note: Wear comfortable walking shoes and bring your swimsuit, towel and sunscreen. A life jacket will be provided. A falkusa is a traditional fishing boat used by fishermen from the town of Komiza and is a subtype of gajeta, a traditional Dalmatian fishing sailboat. Its design was adapted to the specific needs of Komiza fisherman, who went on long fishing expeditions in the open seas, providing them sailing speed and practical characteristics for fish transport. In the 16th century in Komiza bay more than 100 Falkusas were operating. Komiza was the center of the fishing industry in the Adriatic. On each boat there were 5 crew members and they sailed to the most distant locations using sails and rows Today, three falkusas remain and only few people known how to operate them. The island of Bisevo is 5 nautical miles away from Komiza. It is known for its wine variety Plavac Mali and for its rare phenomenon, Blue Cave. You will depart Komiza in the morning hours and hear a short presentation about the gajeta falkusa, its design and characteristics followed by interesting and amusing fisherman and pirate stories. Sailing to Bisevo island, you will anchor and take a short uphill walk to the top of Bisevo island, see the church, local school and taste authentic local food in the family agro-toursim in Poje Village. After lunch continue back downhill to Mezoporat, go swimming if you wish before rejoining the falkusa for a scenic sail back to Komiza. Please note: Wear comfortable walking shoes and bring your swimsuit, towel, and sunscreen. A life jacket will be provided. In the sequel to the famous blockbuster Mamma Mia 2, the island of Vis represents the Greek island of the made-up name Kalokairi, which actually means summer. Most of the scenes of Mamma Mia! Here We Go Again were filmed in the sheltered bay of Barjoska, on the west side of Vis. Your kayaking trip will take you there to enjoy untouched nature and explore the filming location. You will paddle from Komiza to Vis Island. On the way you will visit three nice beaches, hear the story about Manjarema fort, whose remind us of the well known naval battle, known as the Battle of Vis from 1866. Your last stop is the Mamma Mia filming location -Barjoska Bay where you will have time to swim in the crystal clear sea and if you want to keep away from the sun, natural shade from pine trees will protect you. You can also take a short walk, explore the bay and enjoy the scents of rosemary, lavender and other herbs - as there are over 300 kinds of herbs growing on the island. This is a story about the largest fishing industry of the Adriatic, whose center was Komiza. Story about the collective solidarity of the Komizan fishermen in constant danger of pirate attacks and about the unique fishing boat - gajeta falkusa. You will take a walking tour of the most important history sites in the town, hear the best local stories, board a gajeta falkusa - one of the central symbols of the 1,000-year-old fisheries tradition in Komiza, and you will get to try the best local delicacies including "viska pogaca - pastry with salted fish and tomatoes," anchovies in lemon sauce, fish pate, and home made bread. This gastro and history tour will take you all around Vis island – through the picturesque villages, and important history sites to Mount Hum (panoramic view). You will see hundreds of years old vineyards that have been there since the ancient Greek times and hear interesting history facts. You will see the RAF airfield from WW II, enjoy panoramic views of Vis Town and finally taste excellent Plavac (red) and Vugava (white) wines, home-made grappa and liqueurs made from sage, carob, fennel or myrtle, olive oils and famous local dishes. On the way back to Komiza, relax and enjoy the beautiful panoramas along Vis Island. Discover the Medieval treasures of Zadar during this memorable guided stroll through the city's Old Town. The city walls of Zadar attest to its long history of warding off would-be conquerors and rulers, including the Venetians and the Turks. Upon entering the heart of the Old Town, you will explore the highlights of this magnificent city followed by free time. And then you will take a 30-minute scenic drive to Nadin Village to visit the Odžaković farmhouse there. The farmhouse is surrounded by 360 acres of organic vineyards of familiar wine (Merlot, Syrah, Cabernet Sauvignon),along with various fields of crops, paths for walking surrounded by farm animals, birds, rabbits and other animals found there. You will be amazed by the beauty of the traditional stone architecture of the building, the staircase leading you to the heart of the house - a little museum of the Odžaković family, filled with interesting exhibits from 1835 and valuable traditional artifacts used long time ago by the people in this region. The family will provide a traditional snack giving you a great opportunity to taste some of the finest home made products before rejoining your motor coach for the drive back to Zadar. Please note: Wear comfortable walking shoes and bring a hat and sunglasses. Sibenik was founded by Croats more than a thousand years ago dating back to 1066. Sibenik has a well-preserved historical core of buildings and numerous architectural monuments. You will see its ancient fortresses and the Gothic – Renaissance Cathedral of St. Jacob, as well as narrow streets known as “kalas,” numerous churches around this town and its surroundings. Your walking tour will include a the old part of the town where you will visit the finest sites including the UNESCO world heritage site Cathedral of St. Jacob, one of the finest sacral monuments in Dalmatia. You will see the exterior of City Hall, the Baroque Orthodox Church, as well as the historic nucleus with its stone streets, commercial and crafts center. You will board a motor coach and head along the Adriatic Coast toward the village of Stankovci. You will visit the House of Dalmatian´s smoke house, learn about the method of production and specifics of Dalmatian prosciutto, taste and of course buy the products exactly where they're produced. This manufacturing facility is equipped with the latest technological solutions, but also whenever possible, they are using natural system of drying using the strong Mediterranean wind - "bura." Enjoy your lunch of smoked meats, cheese, pate, fritaja, vegetables, salad and traditional Dalmatian Dessert. Join your motor coach for your 60-minute return to Zadar. Start off your tour exploring the famous Nin Salt Works and Salt Museum. At the Nin Salt Works the salt is not produced by the machines nor by man. The salt is produced by the sun, sea and wind and is ecological, therapeutic, and biodynamic. On a small island in the middle of a shallow lagoon the small town of Nin can be found with its old center, connected to the mainland by two stone bridges. Nin has had an exciting past and today a lovely present. You will continue your day with a visit to the picturesque hills, home to the vineyards established in the extreme conditions, on the rocky soil. Top quality grapes from the stone vineyards and excellent wines are the results of a special microclimate, its position by the sea and a full day of direct sun exposure. Finish your excursion with an orientation tour discovering the historical and cultural monuments of Zadar. This walking tour will allow you to see the finest example of Romanesque architecture in Zadar, built in 1324 and dedicated to St. Anastasia. Further on your way you will pass by the Church of St. Donatus which is believed to have been built at the beginning of the 9th century. You will also see the 16th century St. Mary Church with a Romanesque bell-tower built at the beginning of the 12th century. Afterwards enjoy some free time before returning to your ship on your own. Departing from Zadar you will enjoy a scenic sail through Zadar Channel and Mali Zdrelas Passage toward Sabusa Beach. Here you will have time to enjoy the crystal clear Adriatic Sea. Sail towards Kukljica, a small village on the island of Ugljan. Kukljica is situated near the Strait of Ždrelac and it has been called the door to Telaščica Nature Park and Kornati National Park. A stop will be made at Kostanj Bay and Sabusa Beach for swimming, sunbathing and snorkeling. Then sail toward the Island of Oslja.,A light lunch of cold dishes (cheese, ham, salad, fresh fruit) will be served on board. The island of Ošljak is the smallest permanently inhabited island on the Adriatic. It has a protected landscape where olives, pinewoods and cypress give shade to the rocky beaches. The old fishing port with a church from the 5th century is one of the most colorful places in the whole Adriatic. You will leave Osljak Village to head for Preko Village, where their old center consists of typical Dalmatian architecture and numerous patrician family summer houses. The best way to feel the Mediterranean atmosphere is by walking along the quay or sipping a favorite drink on one of the terraces with a view of the Zadar Channel. Here you will have time for swimming or strolling through the Village. Rejoin your sailing boat and continue back to Zadar. Please note: Wear comfortable walking shoes and bring a hat and sunglasses, your swimsuit, towel, sunscreen and extra clothing. Disembark, meet your tour guide and drop off your luggage at their storage facility to start the tour. Venice is composed of more than 100 tiny islets, packed closely together around canals. Venice city is in a lagoon, protected from the sea by a long strip of land called the Lido. You will visit two islands—Murano and Burano. Nearly half of the lagoon’s islands are deserted but the main islands of Burano, Murano and Torcello are well worth a visit. In 1291, when furnaces were banned from Venice as a fire precaution, the manufacturers of fine glassware were transferred to Murano. Glassware was one of the few Venetian exports and as such, the secrets of this skillful craft were tightly guarded. Glassmaking was considered a privileged occupation, and glass artisans were allowed to marry into the nobility. Today, the Murano products of blown-glass mirrors, chandeliers, goblets, and intricate works of art are renowned worldwide. There will be time for a visit to one of the many workshops and for shopping. The island of Burano will be next. Brightly painted houses decorate this small and cheerful fishing village. Burano is well known for its lace-making. In the 16th century, the lace industry was at its peak, and Burano was cited throughout Europe for producing the finest lace. You will have the chance to admire these beautiful works that require hours of labor, and maybe even purchase some, if you like. At the end, motor launch will transfer you back to the port where your luggage will be ready to be re-collected, you will then board your private vehicle to the airport. Please note: Wear comfortable walking shoes and bring a sun hat. Disembark, meet your tour guide and drop off your luggage at their storage facility to start the tour. Your luggage will be transported to your Windstar Hotel. Venice is composed of more than 100 tiny islets, packed closely together around canals. Venice city is in a lagoon, protected from the sea by a long strip of land called the Lido. You will visit two islands—Murano and Burano. Nearly half of the lagoon’s islands are deserted but the main islands of Burano, Murano and Torcello are well worth a visit. In 1291, when furnaces were banned from Venice as a fire precaution, the manufacturers of fine glassware were transferred to Murano. Glassware was one of the few Venetian exports and as such, the secrets of this skillful craft were tightly guarded. Glassmaking was considered a privileged occupation, and glass artisans were allowed to marry into the nobility. Today, the Murano products of blown-glass mirrors, chandeliers, goblets, and intricate works of art are renowned worldwide. There will be time for a visit to one of the many workshops and for shopping. The island of Burano will be next. Brightly painted houses decorate this small and cheerful fishing village. Burano is well known for its lace-making. In the 16th century, the lace industry was at its peak, and Burano was cited throughout Europe for producing the finest lace. You will have the chance to admire these beautiful works that require hours of labor, and maybe even purchase some, if you like. At the end, motorlaunch will transfer you back to the Cornoldi pier (in St. Mark's Square) where you will walk with the tour leader up to your Windstar Hotel. Tour the waters of Venice and the private lagoon with a tour guide and see Venice from the water. Build your own itinerary and have the freedom and independence to linger where you want. The motor launch is available for cruising the city center and the islands of Murano and Burano. Please note: Guests must be able to board a small Venetian motor-launch independently. Guests with mobility problems can have difficulties in boarding the boat. The tour leader is not a tour guide, and cannot give any tour lectures. Tour the waters of Venice and the private lagoon with a tour guide and see Venice from the water. Build your own itinerary and have the freedom and independence to linger where you want. Please note: Guests must be able to board a small Venetian motor-launch independently. Guests with mobility problems can have difficulties in boarding the boat. Please note that the tour leader is not a tour guide, and cannot give any tour lectures.